Albuera, Leyte Mayor Rolando Espinosa has spilled the beans on his son Kerwin's alleged involvement in the trade of illegal drugs, Philippine National Police chief Director General Ronald "Bato" Dela Rosa announced on Tuesday. Dela Rosa said the order for the authorities to "shoot on sight" remains for Kerwin. “The order to shoot on site is still active hanggang hindi siya mag-surrender,” Dela Rosa said in a news conference, in which he presented the local chief executive. "Kung nakikinig ka ngayon Kerwin, you better surrender or die," he added. “Right now wala siyang warrant of arrest. We cannot detain him although he is fearing for his safety that is why he surrendered. Nagpapa-custody siya sa akin,” he said. Dela Rosa instead said he will turn over Espinosa to the Crime Investigation and Detection Group for investigation. Meanwhile, Dela Rosa said Espinosa admitted to him that Kerwin is into drug dealing. "Inaamin niya na ang kanyang anak is really into drug dealing," Dela Rosa said. “Wala tayong pinaghahawakan na kaso sa kanya, kay Kerwin, but still inamin ng kanyang father na he is really into drug dealing in that part of the country, particularly Eastern Visayas,” he added. Dela Rosa said Espinosa told him that Kerwin was getting his supply of illegal drugs from Peter Co, who is currently detained at the maximum security compound of the New Bilibid Prison. 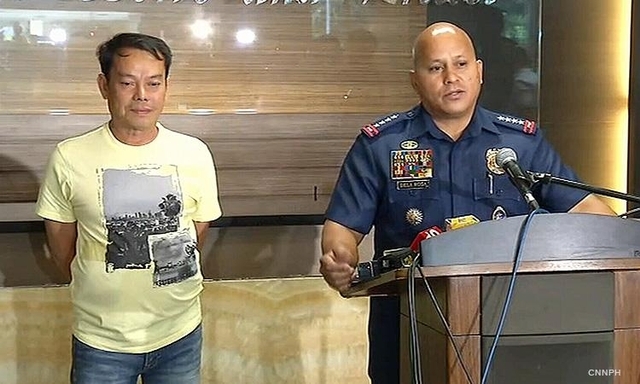 “In fact, inaamin niya na si Kerwin Espinosa is getting his supply of drugs from Peter Co who is right now detained at the Bilibid,” Dela Rosa said. Co, along with Peter Lim and Herbert Colangco, have been identified by President Rodrigo Duterte as the top drug lords in the country.